Holiday Heidi: "Hi, you home? Okay, I'm coming to Newfoundland to visit you"
"Hi, you home? Okay, I'm coming to Newfoundland to visit you"
Growing up it always seemed to be a far off place. I'm sure you have like places too? Not far, just too far. Gosh, it's not like it's at the end of the earth or even the other side of the Country. This Province was just a little more east than where we were, a place surrounded by the Atlantic Ocean, but it was still the East Coast of Canada. Maybe it was because you just couldn’t jump in your car and just drive there? It took planning, as it's only accessible by plane or ferry crossing. Regardless, the older I got, the more I wanted/needed to visit there. Truthfully, I likely would've (eventually) made my way to this beautiful destination ... maybe in 5, 10 or 15 more years. A good friend of mine (a past roommate) was from there, I was always intrigued by his stories of 'home'. Plus, I had just gotten back from that incredible Dominican trip where I had made friends with some wonderful Newfie girls. With invites, exchanging of contact information and the promise of keeping in touch, the possibility of a ‘someday visit' was fast turning into a very likely probability. Everyone does this right? Keeps in touch and a few months later shows up on the doorstep? Haha. I reckon that’s probably very rare, and not even presumably to be the case this time. I had hoped that I'd get a chance to see them again. We were fast friends and I would have enjoyed their company for much more time, in the Dominican, here at home or elsewhere. I just knew that if I ever made it over to visit this place they called 'home' they were on my contact list and my door was certainly open should they ever venture this way. Shortly after our return from the DR was the introduction of a powerful social networking medium, an application that would allow friends who lived near or far to keep in touch. With a little convincing, my NL pal Stephanie signed on. The posts, sharing of pictures and daily communication only strengthened our friendship. Phone chats with Stephanie (and the other two girls: Tracey & Tanya) almost always ended with "you gotta come 'home' this summer"..."come in August". I wanted to go and the more I thought about it, I honestly couldn't answer the question "why not"? "Well okay. I’m coming to Newfoundland to visit you" (Me). And then a whole lot of Whoo-hoos and Tee-heeing. A quick phone call to my travel agent (Cousin Quinn) to book that flight and then the planning of my inaugural trip to NL began. Itinerary's are always in pencil with Stephanie and I, that's what we continue to agree on...just an outline of the moments in between the arrival and departure, always subject to change. I had picked the dates strongly recommended by the girls, it was their town's festival week (much like a 'homecoming' really). There'd be tons of food and music, good times spent with good family & friends. Having never been there, I had no expectations, just happy to see and do whatever they thought of, while being mindful of the budget of course. And with that, Miss Stephanie created the most incredible agenda. Before departure, Stephanie shared a couple of details. We'd be attending the big stadium concert, there was a street dance that we shouldn't miss, some cousins and friends were coming home for the weekend from various places and we'd try to get out in the boat if the weather was nice. All those things sounded lovely. Since this was my first time in Newfoundland, Stephanie was busy trying to coordinate two longtime customs. The itinerary would definitely include a supper where Jiggs dinner would be served. 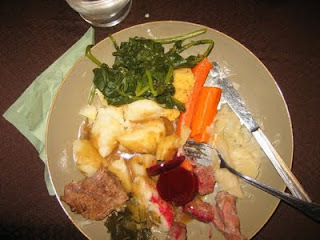 For anyone not having experienced this, a Jiggs dinner is a boiled salt meat dish with all the vegetable fixings: boiled cabbage, carrots, potatoes, greens and split pea pudding (my personal fav), accompanied by pickled beets and doughboys - DELICIOUS. The second custom I would partake in would be a "Screech-In" ceremony. This ceremony would include some singing, dancing, 'repeat after me', the drinking of Screech (Newfoundland Whiskey) and the kissing of a cod fish (etc, etc). All said and done, if I successfully made it through the ceremony in its entirety, I'd receive a certificate identifying me as an honorary Newfoundlander. We had a few months for our excitement to build. Then in August, I boarded the plane for a reunion I won't soon forget. I learned on that flight that most everyone from Newfoundland tries to get home for this festival. I sat beside a girl from Toronto (originally from NL) who was ironically going to the same town, who knew my friends, who hadn't been home for a visit in well over 10 years, but who couldn't wait to attend the 'going-ons' of this 5 day celebration. Natalie and I spent the entire 2 plus hours on that plane laughing and talking like we'd know each other for years and as we flew over "The Rock" I glanced out my window only to realize how little I actually knew of this place. The ocean had turned into land sometime during the conversations with Natalie. Being a clear day it was no trouble to see the landscape below: trees, trees, trees, lake, lake, trees, lake, river. I didn't expect the middle of this Province to be so undeveloped. I didn't expect to see so many lakes, rivers and streams. Somehow I thought that being surrounded by the ocean would be enough. There weren't many roads to see but when we did fly over a little town, you'd see the highway stretch in an east/west or north/south direction, and then more trees. But these little communities weren't all fishing ones like I had drafted in my head. :) How very neat. I had just learned my first of many things on this adventure. And with a bounce (or two), our pilot had delivered us safely to our destination. Natalie and I made our way inside where her family waited anxiously for her arrival. The girls I had met in the DR were all busy today but luckily Stephanie's husband was able to fetch me upon landing. Funny, as I was set to collect my bags I heard a voice just over my shoulder ... "I've seen your pictures on the internet" BAHAHAHA. Phew, he found me (and thankfully it was her hubby)!! Although I hadn't met him until this very second, I knew instantly we were going to become fabulous friends (what a nice, genuine guy...he and my Stephanie make an excellent pair). I guess the drive to the house was nearly an hour, it hardly seemed five minutes before we were in the driveway. Five months had already passed since our fateful trip to the Caribbean, I couldn't wait to see her. We pulled in, the front door opened and I'm not sure if my feet hit the steps on the way to greet her. What a reunion! Stephanie and I are of the same personality type, both of us had thought that when we first met (if you can imagine that there are two of us so similar, scary I know) and now to see each other again. Absolutely Crazy! The girls came up (so great to see Tanya & Tracey again), family and friends came by, guitars filled any silence, the grill was fired up...I'd say the party had started. I was surrounded by the friendliest, most outgoing folks. I believe that Stephanie had taken the time to tell everyone (I mean everyone) that I was coming. "You gotta come meet my Dominican friend, Heidi!" I'm sure I met the entire town, plus friends of friends, in the six short days I was there (it was bliss). You do see the confusion though? Not a lot of people really knew I was from the East Coast of Canada ... I was "Stephanie's Dominican Friend". Hehehe. Well, it was true! So many laughs, such good times. Now that I've brought you to Newfoundland, I'm going to let you hang out at this house party for a bit before rushing through the rest of this vacation. There's so much to share: the remarkable "Screech-In" ceremony, my first encounter with a whale, the windy day in the little boats out in the bay, a visit to Twillingate and plans for meeting up again. I'm so very glad that efforts were made on both ends to keep in touch after our vacation. My best friend lives just a few Provinces away in my very own Country, who knew?! :) And time and time again when I meet people, I tend to meet the very best kind and quite often share the very best of memories. It is my hope that I forget not one person I meet and I can only hope that we keep in contact, thus making the possibility of a reunion that much more likely. the biggest smile on my face, AND tears rolling down my cheeks. "My dominican friend" - funny - and I think they were surprised to meet a girl from NB instead :-) Anyone that meet you on your travels to Newfoundland, felt like they knew you for years !!!! My family and friends love you !!! Can't wait for the party to start because by the time you go home - you are going to be "beat to a snot"
Jiggs dinner is still one of my favourite meals, and there is nothing like getting "screeched in"!! I love NL, and I love your stories and pics, keep it up Heidi!! Our "Lansdowne World Traveller!!"